This document will provide you with a brief tour of our new site. Please click here for a printable version of this article. Each of our sites are developed to consider the user experience and ease of use for the user. All site have a consistent template. 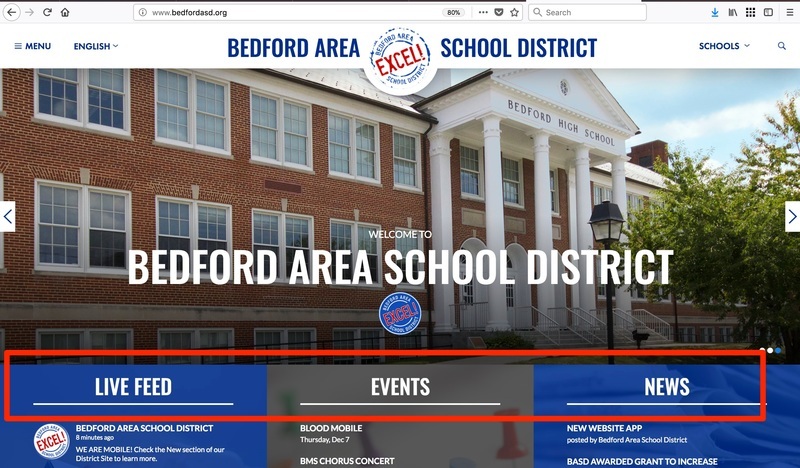 The default view of our sites consists of a site “MENU” in top left and the “SCHOOLS” sites can be chosen from the top right. As you scroll down you will notice that we have 3 sections called “LIVE FEED”, “EVENTS”, and “NEWS”. Each of these areas have information pertaining to the site you are currently on. The “LIVE FEED” serves as a social media feed and will provide short glimpses of current activities as well as reminders and announcements. Longer, more in depth articles can be found in the “NEWS” section. The calendar items for each site are listed in the “EVENTS” section. 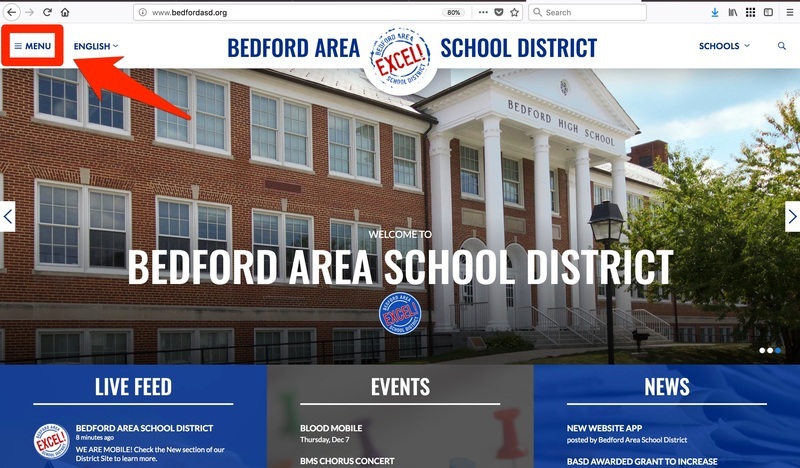 By clicking on the “SCHOOLS” drop down menu on the top right, you may select any of the 5 websites associated with our district. 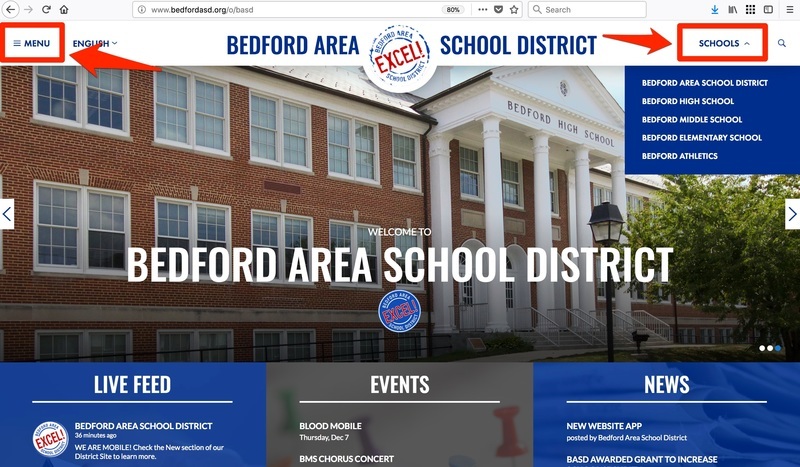 This is the area where you would choose whether you wish to access our district site, High School, Middle School, Elementary School, or our dedicated Athletic site, with schedules, scores, and directions to athletic events. By clicking on the top left is the site “MENU” button, you will offered with the dynamic content options for each site. 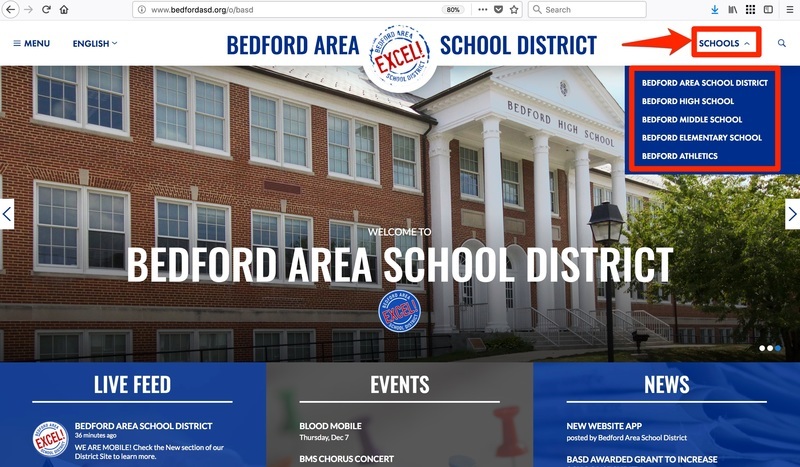 Here is an example of the district site after you click on the site “MENU”. 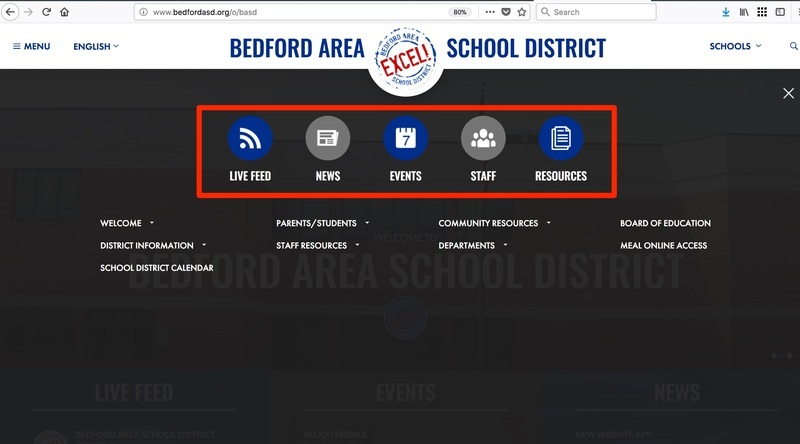 You have a short cut link to the “LIVE FEED”, “NEWS”, “EVENTS”, “STAFF”, and “RESOURCES” for the site that you are on. In this case, it’s the District site. Here is an example of the site “MENU” for our High School Site. You will notice that our building sites have an additional content area called “MENUS”. This section is where the cafeteria menu is published and can be displayed for the upcoming weeks or as all upcoming entries we've entered. The “STAFF DIRECTORY” button provides contact information for our employees. Once in this section, the drop-down menu to the right will allow you to sort personnel by departments. Forms and documents can be found in the folders in the resources section.